The Romans wanted to invade Britain to expand their empire, to look for riches like: copper, gold, iron and tin and to find good land for farming on. The Romans first invaded Britain in 55BC. Julius Caesar led two Roman legions across the sea from Gaul to Britain but the British Celts bravely fought him back. The second invasion was a year later in 54BC. This time Caesar brought with him five Roman legions and 2,000 cavalrymen (horse riders). After more fighting, the British Celts promised to pay tribute to Rome so were left in peace. Nearly a hundred years later, in AD43, the third and final invasion took place. It was led by the unpopular Emperor Claudius who wanted to conquer a new land to get the support of the people of Rome. Four legions of soldiers and an equal number of cavalrymen crossed the Channel in three divisions, landing on the south coast. Many Celtic tribes tried to resist the Romans, with the biggest battle being fought on the banks of the River Medway close to Rochester for two days until the Celts retreated. It took about four years for the invaders to finally gain control over southern Britain and make it part of the Roman Empire. 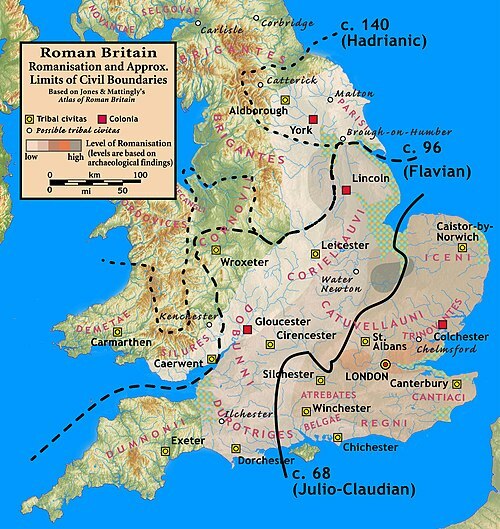 The first Roman governor of the province of Britannia was Plautius. The first Roman city was Camulodunum (modern Colchester). Some Celts made friends with the Romans, in return for keeping their kingdoms. Their leaders were called 'client kings'. They agreed to obey Roman laws, and pay Roman taxes.